THESE images are claimed to be genuine photographs of an ALIEN found in the wreckage of a crashed UFO nearly 68 years ago. The two pictures were made public at a special conference in the US yesterday. It is alleged the grainy pictures were found in a collection of 40 colour slides in the attic of a well-connected American couple when their property in Midland, Texas, was being cleared before sale. A slick movie-style documentary trailer accompanied the release of the pictures, suggesting to be the story of an investigation by a journalist after they came into his possession. The clip described how the pictures were among the personal snaps of well-travelled couple Hilda Blair Ray, a prominent local attorney, and her husband Bernard, a geologist working in the oil industry at the time. The pictures appear to show a humanoid with a large head on a clear glass shelf and in a glass enclosure. They have been described as of extremely poor quality compared to the rest of the slides in the collection, said to be taken between the mid 1940 and 1950s. The release of the images has sparked huge debate and division among UFO and alien groups online. Many are clutching onto the hope that they are the genuine article, while several others claim they have been hit by a sophisticated hoax, thanks to modern technology. 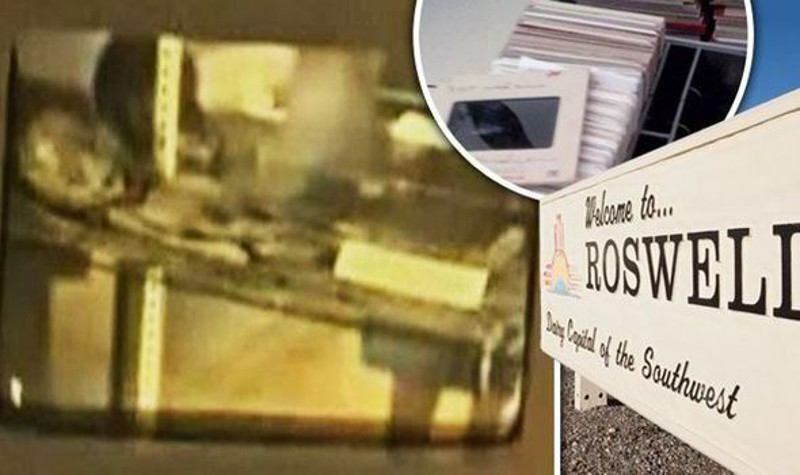 They claim the photographs are a bid to cash in on the 20th anniversary of a previous scam, when amazing pictures claiming to reveal a secret autopsy on an alien corpse emerged in the 1990s. The UFO Chronicles website spoke with Tom Carey and Don Schmitt, authors of Witness to Roswell, an account of the Roswell incident. Mr Carey said: “It was three-and-a-half to four feet-tall. The head is almost insect-like. The head has been severed, and there’s been a partial autopsy; the innards have been removed, and we believe the cadaver has been embalmed, at least at the time this picture was taken. While Mr Schmitt argued: “No, it’s not physical evidence, and it’s important to understand when a picture has value. “Usually, a photo can begin to be considered supporting evidence only when time, location and the photographer are known. “In addition, it’s vital to know what instrument recorded the data. We don’t have the camera or any of the other information about how the slides of the body were taken. The Roswell story, of authorities keeping the discovery of the alien a secret from the public, has long been regarded as the world’s biggest alien mystery, since it first broke in the 1940s. Extraordinary photographs appearing to show a secret government autopsy taking place on a corpse, which emerged in 1995, were later proved to be an elaborate hoax. The Fermi Paradox: If aliens exist, do they know we’re here?